8 Comments for "Pear Quesadillas"
Update: We followed the above recipe, but added a few cooked black beans, and fresh baby spinach -- it was even better than before! This is really good with gouda cheese! Lots of people doubt this recipe but if you can convince them to try it (sample!) they are hooked. I tell other moms it is a great way to sneak fruits and veggies into your kiddos. You can sub zuchini or tomatoes for the peppers and sub apple for the pears if you've got them on hand. All combinations have been delicious! These were a big hit with my classes, both teen and adult. It *did* take the teen chefs longer to prepare the recipe (30 minutes, not 10), and it was VERY difficult for both teens and adults to flip the quesadilla, when adhering to above directions. We even tried the "slide to a plate, then use the plate to flip the quesadilla", but that didn't prove much easier. We found that instead of making one GIANT quesadilla (using 2 tortillas) it was easier to use one tortilla, folded in half. It was much easier to flip the tortillas when they were smaller, with one edge closed off. 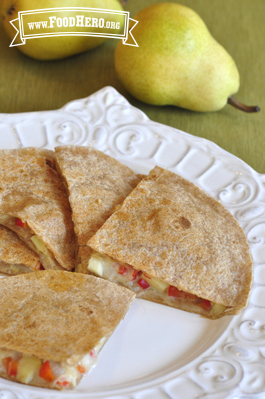 Some students thought that pears sounded really weird in this recipe -- but then they tried it, and really liked it. The whole family loved these! We used pepper jack cheese, added some chiles and topped with some low-fat sour cream and salsa. These are great! The pear really adds a lot to it! These are so tastey! Love the Pear Crunch! ou! this sounds interesting! I'll try it for dinner tonight!